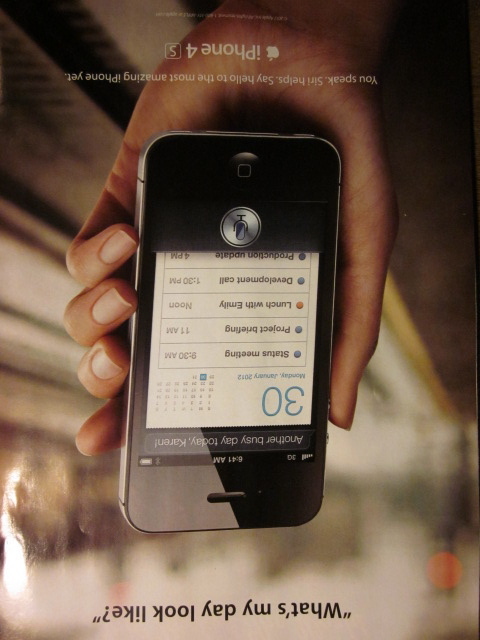 This iPhone 4S ad is on the back cover of the February 27th issue of The New Yorker, the current issue. I stared at the copy for a full ten-count partly because I was confused and partly because I had nothing better to do with my time than to blow it looking vacantly at magazine ads. Amazingly, I was not at work where I perform the lion’s share of my mindless time wasting. In fact, I was home; I had just eaten dinner followed with a bout of food coma where (hide the small-fry from the sensual image to follow) I passed out with my drooling face pressed into this ad. Thanks to my buzz saw style of snoring, I eventually revived. 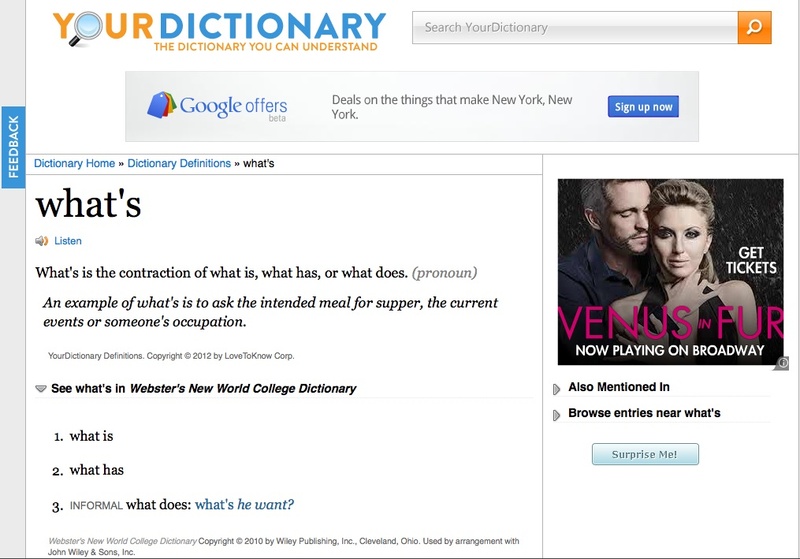 The contraction “What’s” is what baffled me. I knew the question this iPhone 4S user was asking was not, “What is my day look like?” Unless they’re so addicted to the name of that American treasure, the I Can Has Cheezburger site, they’re suffering permanent English impairment. For a moment, it occurred to me that this particular iPhone 4S user could be someone that speaks English as a second language. My pal Coco has a friend with a heavy European accent. When he first got his iPhone 4S he dictated an email to Siri intended for Coco. Siri could not understand his accent at all, so she guessed at what he was trying to say. Siri also omitted punctuation. When Coco received his email, she thought he had suffered a stroke. Yet, there is nothing else in this ad that indicates that this iPhone 4S user is not an ordinary English speaker, but why did they speak such lousy English? Or, did they? Siri (snarling): Another wasted day, today, Lame! Okay, so I’m amongst the select breed of minimalists that still uses a mute dumb phone, and I also happen to make my toast by drying slices of bread in the sun, but stuff it with the fancy schmancy-ness, Siri. Your ad’s crummy copy started this! This entry was posted in Humor and tagged apple, apple iphone 4s, siri, slacker, slacking, the new yorker. Bookmark the permalink. What remains of my left brain knows that site is correct, but my shreds of right brain thinks that copy reads terribly. Apple should have thought differently copy-wise. Thanks for visiting Jeremy! I don’t know, I have to go with Apple’s intent. What kind of person is Apple trying to attract with this particular piece of copy? In the end, I would say don’t let poor copy bother you; you’ll go crazy, or at least lose your teeth from grinding. I’m pretty sure I’ve already reached crazy, Jeremy, bit it does feel like home. I hope we’re going to tackle the great usage of the contraction “ain’t” next. Since you sit three feet away from me, that could be Friday’s Topic of the Day, as we mindlessly toil away while you rule the radio. I just pulled my New Yorker from my briefcase/satchel and got a closer look at the ad. Gotta say that in print I tend to agree with you; but in practice I know I’ve used that contratction. Just lazy I guess. But how did you like the Calvin Trillin piece in Shouts & Murmurs on pages 38-39? I almost was asked to leave the *quiet car* on my NJ Transit commute back to the ‘burbs as I chuckled (there’s that word again) to myself. I liked the second one featuring Callista quite a lot, but in the first one I was amused with the title “vice president for chancy loans”. What’s it mean that I didn’t have a problem with the ad? Yes, it is breezily colloquial. That’s the entire point. A Microsoft Windows user, in this context, might have asked, “What is on my schedule today?” Precise, correct, and clear. Apple is trying to convey the idea that Siri understands what you *mean* regardless of how you say it. Ergo, the ad would have worked equally well with, “What’s shakin’ today?” or “Gimme a readout.” Apple users are, as the company envisions them, hip, iconoclastic and trendy. They want technology to conform to them, not the other way ’round. See how this ad nails it? Back page of the New Yorker runs about $175,000. They aren’t going to waste that with a throwaway ad featuring ill-proofed grammar that nobody looked at. Rather, a team of highly paid pros labored on this for a long time. The effort shows. So ask your friend to text you the spoken “What’s my day look like?” and see what Siri translates it as. Good question but Coco and Siri are not on speaking terms right now Jeremy. Rejection comes early to that earnest young man! This proves how the iPhone is now a product for the masses! Hmm, I still can’t afford one. Boo hoo. Hey, J, thanks for visiting Lame Adventures-land!